Poland has recently taken centre stage in the vaunted theatre of geo-politics, as it is the chosen “third site” for the Bush Administration’s anti-ballistic missile defence shield. The negotiations have entered their second year but are rapidly approaching a boiling point. Bush and his advisors are frustrated and visibly annoyed at Polish PM Donald Tusk’s refusal to simply roll over to US requests, which is the response Washington has grown accustomed to from other Polish leaders, specifically ones of the twin-brother varieties. On Tuesday May 13th Tusk announced that Poland was turning down the US offer of $47 million to modernize the Polish military in exchange for allowing the US to install anti-ballistic missiles in Poland for its “third site.” This decision came after a year of negotiations between the US and Poland, which started out quite favourable for the US shield in May 2007 under the leadership of hawkish former Polish PM Jaroslaw Kaczynski. Since Tusk and his Civic Platform party were elected in November, negotiations have grown increasingly tense and culminated with his decision of May 13th. “The United States, our ally, is completely free to make decisions. We have the rights and we will exercise the right to formulate our own conditions, our expectations,” said Tusk. He also acknowledged that the missile shield is generally unpopular in Poland and that it would clearly agitate and antagonize an increasingly aggressive Russia. In the ensuing weeks after Tusk?s announcement negotiations have all but broken down. It appears that Washington has no intention of agreeing to Tusk?s appeals for a larger aid package and has flat out refused to provide Poland with Patriot missiles. The strange twist is that even though Washington isn?t giving up any strategic concessions, they are growing more insistent that a deal can and must be reached as soon as possible. According to recent statements from assistant Secretary of State and head US negotiator Stephen Mull and comments from Bush himself, it seems as is if the administration isn’t taking Tusk seriously at all. Not even two days after Tusk?s speech Bush met semi-secretly with Polish President Lech Kaczynski. Poland has a dual executive system and technically Kaczynski could broker a deal with Bush without the consent of Tusk, Parliament or the Polish people. But for now, the negotiations continue and Tusk still has the reigns. The US is holding to its claim that the missiles are in no way a threat to Russia and therefore they deny that placing missiles in Poland poses a strategic threat to Poland itself. This line of reasoning is a bit tough to swallow. If the US places missiles in Poland, even for defensive purposes, Poland would immediately be susceptible to attacks from any third parties, i.e. Russia or Iran, wishing to cripple US strategic military assets. In fact Putin and newly-elected Russian PM Dmitry Medvedev have both recently reiterated that the US plan threatens Russia?s national security and if a missile site were to be completed then Russia would immediately target nuclear warheads at Poland. Not so friendly. 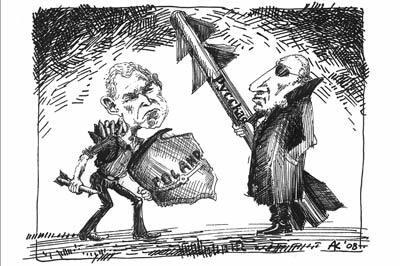 According to the Bush Administration, the purpose of the missile shield is to defend Poland, NATO allies and the EU from potential “rogue” nations like Iran. With this said the US is refusing to provide Poland with the money, resources and arms to adequately fortify the proposed missile base and/or modernize the army to sufficiently defend itself against the kind of threats they would face having such a missile system placed in Polish territory. “Unless the Americans significantly improve their offer, we’ll return to the talks only with Mr. Bush?s successor in place,” said an official close to both Tusk and Foreign Minister Radek Sikorski, chief Polish negotiator. The gap is widening in terms of the rational debate and if negotiations do break down it seems likely that Bush will try to circumvent diplomacy by signing a deal with Kaczynski himself. Those that strongly oppose the missile defense plan can only hope that Tusk has the final say. He hasn?t succumbed to the East vs. West cold war mentality that has dominated the negotiations and media coverage up to this point. And even though the US and Russia are clearly assuming their well-rehearsed roles of forcing Poland?s hand, this doesn?t necessarily mean that Poland has to once again play the pawn. Thanks very much for an informative article..